Depositphotos is a growing stock photo agency with similar approach as other stock photo websites. It highlights their pricing and buyer bonuses – which feature inexpensive subscriptions and credits. With over 60 million stock images in the library, it is not hard to see why many creative professionals consider the stock site as one of their top choices. Another great quality of Depositphotos is how it continues to work with the stock photo agency community to make the website better. In addition to its subscription and on demand plans, the stock site introduces the new Flexible Plan, which is available in monthly or yearly payment. 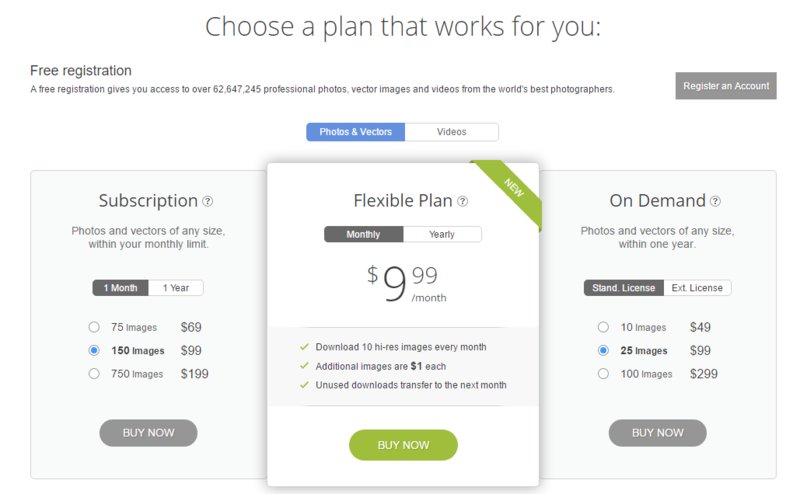 The Flexible Plan allows you to download 10 high resolution images every month for only $9.99 per month. You can purchase additional images for only $1 each. Your unused downloaded will be rolled over to the next month. If you have a one-time need, the monthly Flexible Plan is perfect. However, more consistent creative needs require the yearly plan. Now, what’s the difference between the two? You get the same number of downloads, the price of additional purchases, and the rollovers. But, the yearly plan comes with a 20% discount. If you’re certain you’re going to need images in the long term. Take the yearly plan and save more. Are you new to Depositphotos? No problem. You don’t have to purchase a plan to find out if the stock site suits your creative needs. You can register for free and access the over 60 million photos from the world’s best photographers. The free subscription to new members lasts for 7 days – enough time to gauge the content of the website. What are you waiting for? Check out Depositphotos and access high quality royalty free images and high definition footage at the best prices to fill your creative needs.